Well before the glory days of the NASCAR late model sportsman, when the eastern U.S. was full of tracks running everything that came and went in and out of style such as the Nova, the Ventura, the Thunderbird, the Pontiac LeMans, the Buick Regal, and so many more. There was that tentative look at the post World War II body invading the sacred grounds of the modified and sportsman coupes. Somewhat before Pete Corey came to Fonda with the Falcon – bodied sportsman car, around 1964 [which, along with the Judkins Pinto helped touch off the modified body revolution] there was that first try at fielding something other than the pre – WWII coupes and sedans. Pete Corey’s revolutionary, trend – setting Falcon doesn’t count here – it came after the early Fonda experiment was long over. 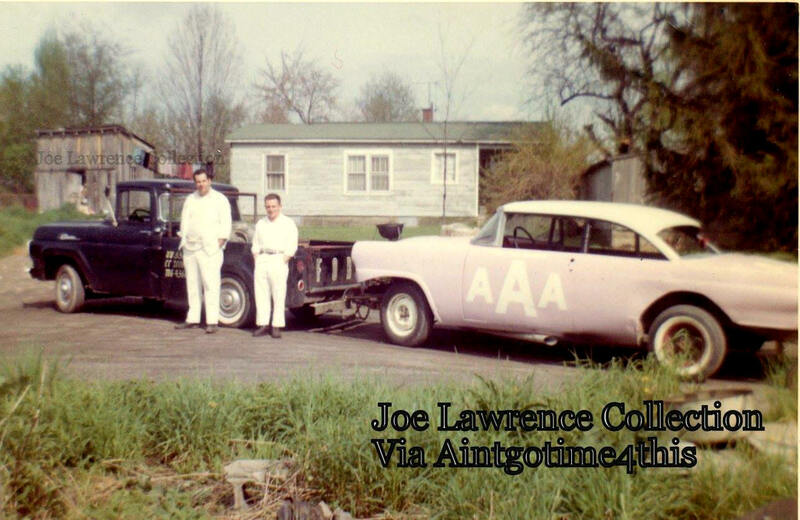 Below - Jack Anderson, now a LLOAR member, tried this late model sportsman at Otter Creek Speedway in 1961. I have never quite gotten the whole straight, but – sometime in the 1950’s, NASCAR offered sportsman competitors some type of horsepower advantage if they would run post – WWII bodies. Several teams in the area of Fonda, Victoria, Lebanon Valley, Stateline, and the others in that region decided to try them out. Few, if any, abandoned their pre – war coupes and sedans entirely; but, rather, they added a car [usually a 1951 or 52 Chevy coupe]. That type of car, while having been first thought of by NASCAR, caught on much better at the non - NASCAR Lebanon Valley track. The predominant car at Fonda in the early 1960’s was the upright sportsman coupe, like the 7 of Ken Canestrari, who still drives a modified today. Below - The Valley also still a few cars with the pre - 1937 bodies, like Jimmy Markel's 95. I am not sure I ever saw any of these ill – handling beasts; the experiment must have been over at Fonda before 1963. There was one backmarker named Doc Nellis, from Little Falls, NY, who had a fastback Chevy; but he scarcely qualified as a sportsman at all [in fact he scarcely qualified, period]. One team that had a late model entry was Frank Trinkhaus, out of Frank’s Speed Shop in Fly Creek, NY. Trinkhaus, who had a variety of top names as his driver over a period of almost a decade, did field a Chevy business coupe which was drilled full of holes to try and lighten the monster up. Most of the time, the lucky driver was Howard “Jeep” Herbert of Rotterdam, one of Frank’s most frequent chauffeurs. As one writing piece put it, Jeep would bravely wrestle the ornery car around, but never with much success. The Trinkhaus #62 ran primarily Victoria and Fonda. the myriad of holes drilled into the body to try and lighten it up. 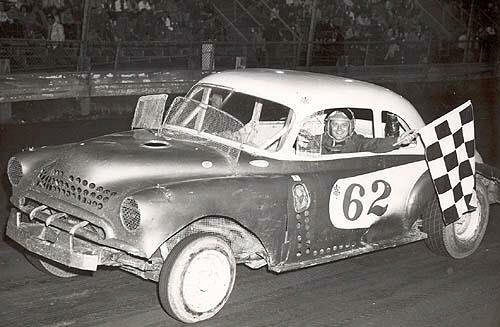 Another group with a post – war sportsman car was that of Schenectady’s Richard Welch, whose red #77’s were a staple at Northeast NASCAR tracks, as well as Victoria. The 77 was seen as far away as Vergennes, Vermont’s Otter Creek Speedway, with Ed Pieniazek at the controls. Welch had a car that looked a lot like that of Trinkhaus, although I don’t think it was the same race car. It appears, through photos and 8 MM film footage that whichever driver [including the lucky Herbert] drove the 77 late model could keep up with the field, but not pass much. Henry Caputo, the dynamic late '50's car owner out of Hudson Falls, NY was best known for his uniquely color – schemed, red and white stock cars 11 and 111. Caputo was fielding a very high end team for those times, including matching stake body trucks. He employed top drivers like Ken Shoemaker, George Baumgardner, Jeep Herbert, Earl Maille, Tom Kotary, and others. I noticed a photo of Victory Speedway, Middletown, NY in which not only is one of those trucks shown; but, the car on the track looks to be a Plymouth business coupe around 1949 or 1950. 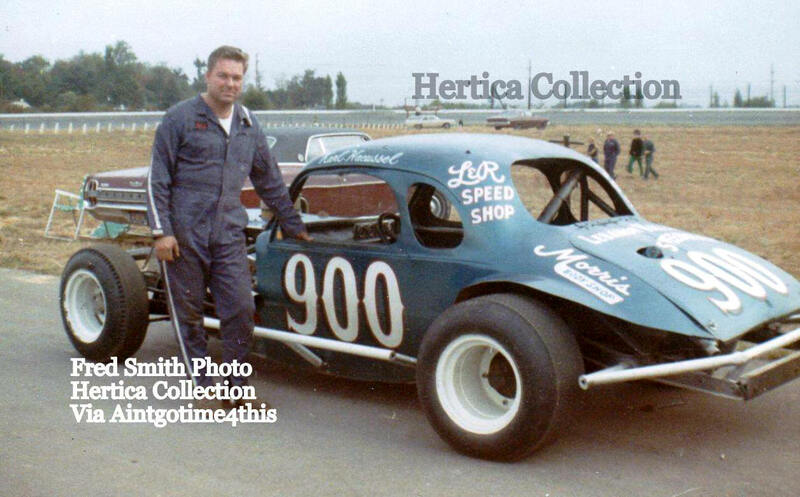 This grainy photo shows Richard Welch’s late model at Victoria. The poor quality is because it is out of old 8MM movie footage. Below – The Henry Caputo entry – likely a Plymouth. 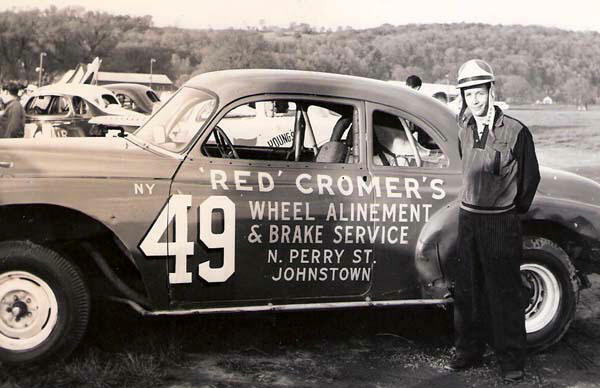 George Baumgardner, one of Welch’s hired drivers and a survivor of the pre – was open wheel days, also appeared with a Chevy business coupe fielded by Johnstown, NY’s Red Cromer. I have heard that there were only about two of these cars, which changed hands a number of times; but, none of the three above – mentioned cars looked much alike – in terms of body modifications and such. There are also a few John Grady shots of a #12A which Roger Gauthier drove. 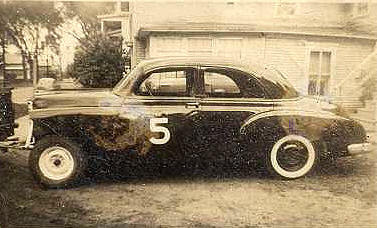 The car, an unusual three window Chevy business coupe was owned b y Donald Gallo of Schenectady. uncompetitive Gallo car. Below that – Gauthier tries to hold off the speedy Pete Corey. Fonda rival, the Lebanon Valley Speedway, in New Lebanon, NY, also went through a similar period of experimentation with the late model body. Here, the advantage / choice was much clearer. Those choosing to run the traditional pre –war bodies had to run flathead [or maybe six cylinder] engines; anyone opting to run a late model body could install an overhead V-8 engine. Unlike Fonda, the late model became the way to go at Lebanon Valley for a few years, from around 1959 or 1960 to somewhere around 1967. Perhaps inspired by the movement at Lebanon Valley, Fairmont Speedway’s Art Visconti tried this ’53 Ford briefly around 1964. At the Valley, many of the more successful and winning teams were running the newer and heavier bodies. The poster boy for the late model body was New Yorker Link Pettit, running for the Winn team out of Great Barrington, Massachusetts. 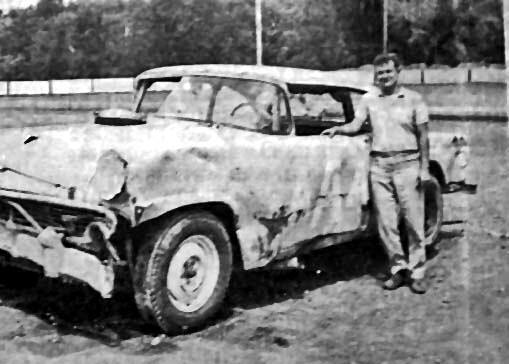 The Uncle Art Stuarts history and record book of 1970 shows Howie Westervelt, of Ravena, winning the track title in 1959 with a ’55 Ford; Stretch Van Steenberg, out of Saugerties, NY, took the 1960 title with a pre – war sedan; D.D. “Rebel” Harris won it all in 1961 with a late model Ford; and Johnny Flach won out in 1962 with a pre – war Ford coupe. In 1963, Doug Garrison drove Martin Riiska’s pre – war sedan to the title; but, Van Steenberg piloted a 1955 Chevy to the win in 1964. Karl Haeussel won in 1965 and 1966 with late models; and Ed Delmolino drove a late model Ford to the title in 1967. 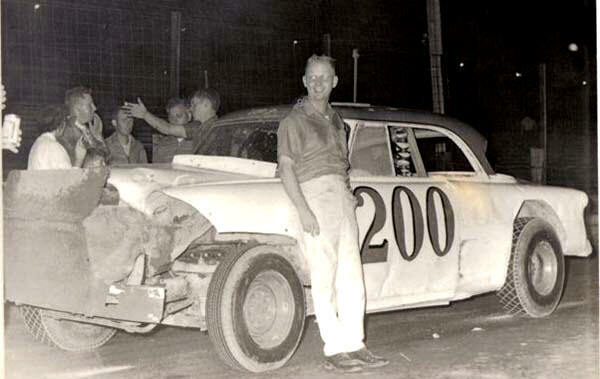 Link Pettit, with the Winn 200, enjoys a laugh in Victory Lane at the Valley around 1960. Pettit would run late model bodies for two different teams. Below – Dee Goodermotte had an early Chevy body at the Valley similar to later Fonda cars. After that, I believe the late models were either phased out or fell out of favor at the high – banked Valley oval. 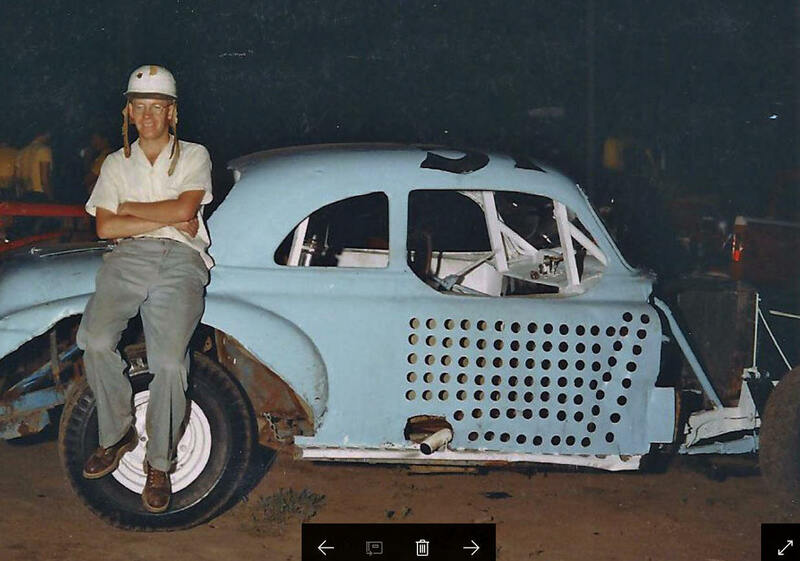 While pioneering the use of late model Falcon and Studebaker bodies at Fonda, pretty much on his own, Pete Corey built a 1955 Chevy car just to fit in, when he abandoned Fonda to run the Valley in the late 1960’s. Fonda finally looked to the success of Albany – Saratoga Speedway’s semi – late model division and instituted a late model class of its own in 1968, much to dismay of the purists in the grandstands. The division would spawn several future modified stars such as Harry Peek, Ken Platt, Jerry Pennock, Ralph Holmes, and Gene Mangino, to name a few. Karl Haeussel won two straight Valley titles with a late model – bodied car. Technically, this one was more of the traditional type that the 1952 Chevy he had the year before. Below – Like many others, he went back to coupes when rules allowed. The history of Lebanon Valley Speedway is rich with late model teams, while the late model car rated only two pages in the part of the Fonda Speedway history book that dealt with this particular era. I saw the influx at the Valley, with my own eyes, when the Valley group staged a race at the Vermont State Fair in Rutland, in 1960. The late models of Pettit, Harris, and others were just as prominent as Jelley’s #Y coupe or Garrison’s yellow X sedan. The newly built AAA Ford, as built by Harris and Mitchell, with support from Joe Lawrence. Below – the car as it looked in Rutland that day, a little more used by then. Doc Nellis' final car was a recycled Frank Trinkhaus late model.